Periodontal diseases are chronic infectious diseases characterized by a destructive inflammatory process affecting the supporting tissues of the tooth. Numerous bacterial species have been isolated from subgingival plaque, which are closely associated with disease onset and progression. At the same time, there is strong evidence that destructive processes occurring as part of the host inflammatory response are responsible for the majority of the hard- and soft-tissue breakdown leading to the clinical signs of periodontitis. The characteristic clinical signs of chronic periodontitis occur mainly as a result of activation of host-derived immune and inflammatory defense mechanism. IL-1 and TNF induce expression of other mediators that amplify the inflammatory response, such as prostaglandins, and lead to production of lytic enzymes and stimulate the production of chemokines. Depending on its function, the cytokine have been classified into those which initiate and maintain inflammatory process, labelled as pro-inflammatory cytokines and those which exert an inhibitory effect on the immunologic response. These negative regulators, categorized as anti–inflammatory cytokines, include IL -4 and IL -10, inhibitors such as IL -1 receptor, antagonist soluble IL -1 and TNF receptors that act as a competitive blockers under pathologic conditions such as those that occur in periodontal disease. Noteworthy is the fact that cytokines which play an important role in inflammatory responses are also prominent regulators of normal tissue homeostasis. In fact, mRNA expression of cytokines that have been associated with periodontitis was constitutively detected, to some extent, in clinically healthy gingival tissues. The complex interaction of the cytokines at the molecular level is yet to be fully mapped. Additionally, further research pertaining to the other accessory arms of the cytokine network, such as the tissue metalloproteinases, the components involved in the acute phase of immunity as well as wound healing will augment the future of treating human periodontal disease via immunotherapy by modulating/ controlling the key pro-inflammatory cytokines. 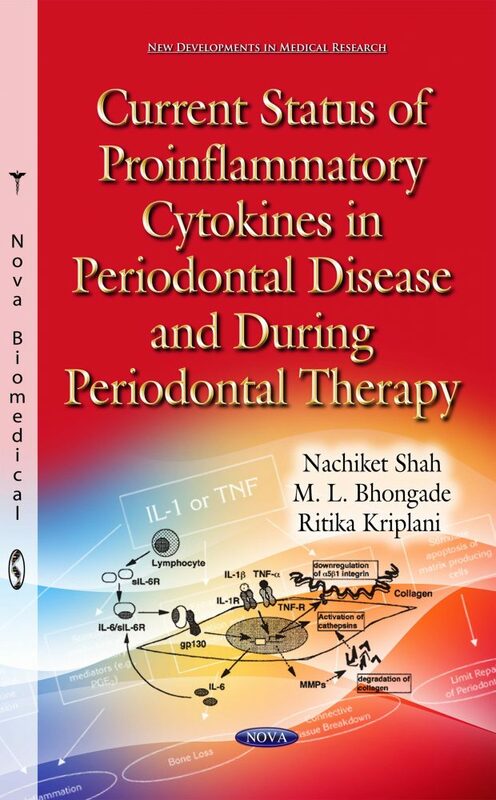 It is the comprehensive review on cytokines and its effect on the onset of periodontal disease and their levels during / after periodontal therapy. It would be a complete literature for Post graduates, for Researchers at molecular biology level and to explore the future aspects of periodontal treatment. Principle audience for this book / literature would be medical / dental graduate students, Post graduate students, molecular biology researchers, pharmacy students, medical microbiologists, Immunologist, academic scientists, industry clinical developers, and government researchers to discuss complementary approaches in the field of cytokine biology.